This is the most common procedure used to relieve urinary stress incontinence. It is suitable for men with mild to moderate stress incontinence that has not responded to conservative measures. The male sling involves insertion of a mesh sling beneath the urethra for added support. The procedure is usually performed as a short day procedure at the Sydney Adventist Hospital but occasionally an overnight stay may be necessary. The sling is placed through a small incision in the urethra, made via the perineum. There may be other small incisions within the groin creases or by the pubic hair line depending on what kind of sling is placed. After the sling is properly positioned, it forms a cradle underneath your urethra which provides support helping to prevent urine from escaping during activities or straining. 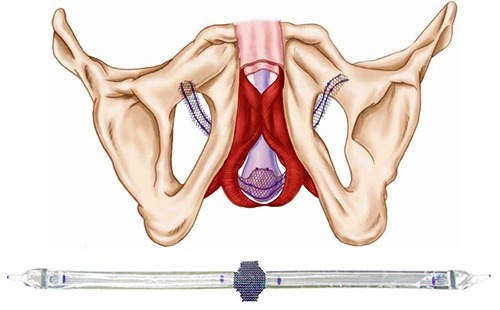 Over time, the tissue under the urethra will grow around the synthetic mesh sling further reinforcing support. Some slings work slightly differently: their placement results in increased pressure on the urethra to decrease the possibility of urine leakage. At your initial consultation, the procedure will be discussed in detail allowing you to decide which sling is right for you. Most of the time no catheter is needed on discharge. The device does not need to be activated, and most patients see an improvement in continence immediately after the procedure. Every patient’s recovery is different: a sling procedure is a minimally invasive surgery, but you may experience some discomfort and fatigue during the first 24 to 72 hours post-operatively. You will need to abstain exercise, physical activity, straining and sexual activity for a period, and you will be advised accordingly. You should contact Doctor Katelaris immediately should any problems occur after surgery especially a high temperature, or inflammation, excessive pain and redness in the surgical area. For men with moderate to severe urinary incontinence the inflatable artificial sphincter is the standard of care. A balloon reservoir placed in the abdomen. An inflatable and deflatable urethral cuff that surrounds the urethra. A pump that is situated beneath the scrotal skin. The cuff works much like a healthy urinary sphincter, gently squeezing the urethra closed to keep urine in the bladder except during urination. When the control pump is activated the fluid drains to the pressure balloon and allows urination. 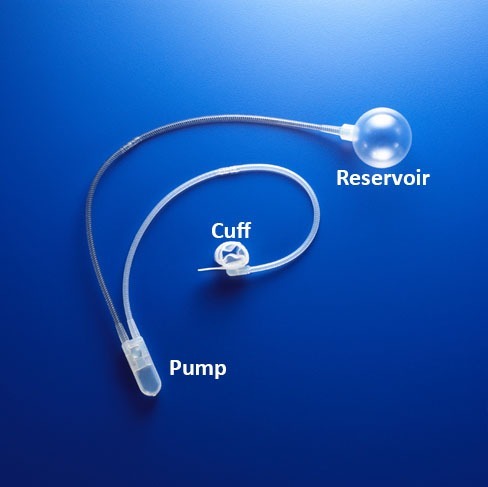 The fluid automatically returns from the pressure balloon to refill the cuff after urination. Once full, the cuff again squeezes the urethra closed. The artificial sphincter is inserted via a small, transverse scrotal incision. You can expect to be discharged after a short, 24 hour stay in hospital. You experience unusual or prolonged pain, redness, swelling or rash near the incision or scrotum. Pus coming from the surgical incision. You are unable to locate the control pump. It is important that the device remains deactivated while you are healing. You will attend for a post-operative appointment after six weeks where the device will be activated and you will be taught the technique of manipulating the scrotal pump to relax the cuff. It is safe for you to have an MRI and the device will not be detected by airport security. The device has a deactivation button which allows it to be turned off; it may need to be deactivated before you have certain medical procedures in the future such as catheterisation or cystourethroscopy.